Dogs Dig Our Bone Broth! 09-24-18 Dogs Dig Our Bone Broth! 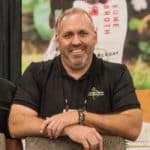 This week, Dr. Judy welcomes classically trained Chef, Product Development Specialist and Co-Founder of Primalvore Holistic Canine Nutrition, Don Hensley, coming to us from Des Moines, Iowa. Don grew up in Dallas but as a teenager, moved across several states. He later attended the Culinary Institute of America to become a professional chef and worked at a country club, a hotel and even his own restaurant and bakery. In 2011, Don went to work for a food scientist from New Zealand to develop clean label, organic products for the U.S. restaurant market. In 2015 he worked with Kettle and Fire to develop the first shelf stable bone broth for humans and shortly thereafter he developed a version for pets. Smokey, Don’s 90 pound pit/lab rescue, dealt with various allergies and joint issues, and was the inspiration behind Primalvore. This is the only Superfood Bone Broth formulated specifically for dogs and their needs with the addition of collagen peptides to promote the health of bones and joints, strong nails and shiny coats. Whether your dog is a puppy, adult or senior, be sure to tune in to hear Don and Dr. Judy discuss the many ways a quality bone broth can help keep your dog healthy and happy for years to come.